A master class for young chess players took place on May 15th at the gymnasium #3 and was attended by 65 pupils from various local schools. The simultaneous displays were held by grandmasters Ernesto Inarkiev (participant of the FIDE Grand Prix stage), Zurab Azmaiparashvili (FIDE Vice-president), Evgeny Sveshnikov, and international master Eldar Mukhametov. 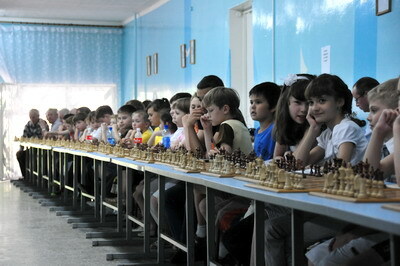 Their opposition mainly consisted of pupils of 1st-4th grades. Chess experts greeted their opponents and wished them luck before the game. After the simuls the professionals mentioned a high level of skill of the young players, who acted without rush, calculated well and were not disturbed by media attention.